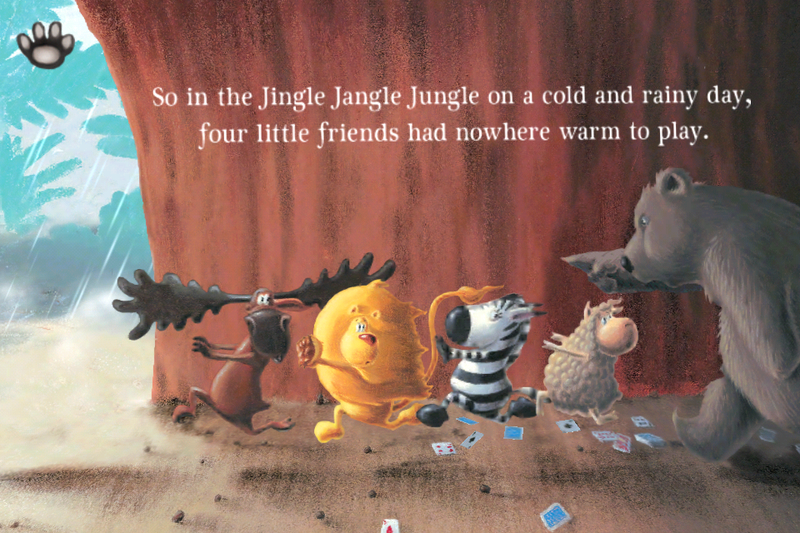 "In the Jingle Jangle Jungle on a cold and rainy day, four little friends found a perfect place to play," begins this delightful animated tale. Based on Nick Bland's 2008 print title about a zebra, moose, lion and sheep who just want to find a nice, dry place to play cards on a rainy day. Each animal tries to placate the angry bear in hopes of sharing his cave. But they assume the bear would want what they want (a beautiful mane like the lion, great antlers like the moose or stripes like the zebra). In the end, it is the humble sheep who has the most brilliant idea and generous sacrifice to make, on behalf of the bear's true comfort. Light interactivity and perfectly timed animated elements create a wonderful storytelling experience in digital. Perfect even for bedtime reading, this tale has all the elements of a memorable story regardless of format. Page turn is by swipe, although it can be slow to respond at times. There is also no other way to navigate through the book, should you want to find a favorite page, so I would love to see a page guide added in a future update. Otherwise this digital book is flirting with perfection, featuring exceptional production values that enhance a well-crafted and beautifully illustrated story. Nice extras include hidden cards for each of the five animals that unlocks a game in the end. Readers can then 'dress the bear'. You can also record your own narration for the story, giving young readers the chance to try out their read-aloud skills or for younger readers to enjoy a tale narrated by a familiar storyteller in the family. Overall an exceptional story worthy of any digital collection. Highly recommended! Four friends, a zebra, a lion, a moose and a sheep are trying to find a place to play cards out of the rain. They find a perfect spot, a dry cave that is unfortunately also inhabited by a very cranky bear. Each of the animals is very proud of his looks. The moose values his 'marvellous' antlers, the lion his 'golden' mane, the zebra his 'fantastic' stripes, but the poor little sheep is just plain and has nothing to brag about. The four friends begin playing cards happily when all of a sudden ... "Roar!" ... a BEAR! The cranky inhabitant of the cave chases them out back into the rain. But now where will they play? The zebra suggests they try to cheer the bear up ... "if I did not have stripes," he surmises, "I'd be cranky too.". Each animal then decorates the sleeping bear with different items that reflect their own vanity. So the zebra paints stripes on the bear, the moose places antlers on his head and the lion creates a fancy mane for the slumbering ursine. Only the sheep stays back, having nothing to offer. Waiting at the edge of the cave, the sheep hears the bear coming out, even crankier than before. The other 3 run away, but the sheep cannot move and is confronted by the angry bear. "All I really want is a quite place to sleep!" says the bear. The sheep, terrified but quick thinking, decides to shave half her wool off and stuff it into a nice, soft pillow. She tip-toes into the cave and politely asks if the bear might like "a pillow for underneath your head?" Soon the bear is sound asleep, never minding the four friends who now curl close to play cards. Perhaps being plain isn't so unremarkable, after all!